Alter your daily makeup routine with Transformation, PÜR’s revolutionary, sculpting eye shadow and cheek palette. The putty-to-powder eye shadow and cheek shades allow for instant color payoff and adheres to the eye lid or cheek like a second skin. Made with Moroccan Lava Clay and our proprietary skin care, Transformation helps to improve the appearance of the skin with each use. 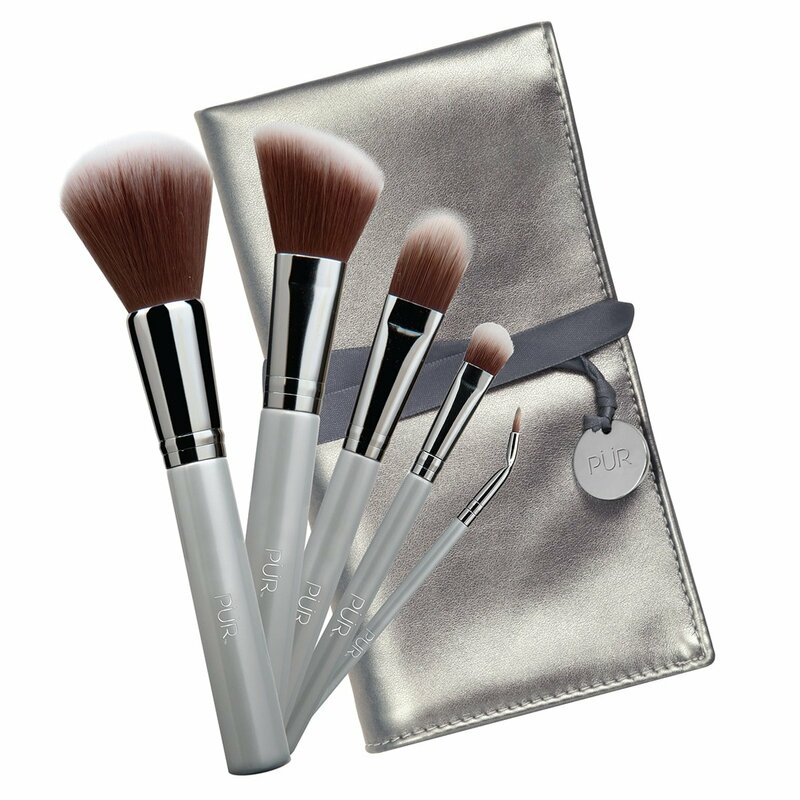 Use your finger to press and sculpt the shades into your skin or apply with your favorite brush. This product has been ocular tested to ensure it will not irritate eyes or interfere with contacts. This product and its container are free of Bisphenol A (BPA). MICA, ZINC STEARATE, MAGNESIUM CARBONATE, CAPRYLIC/CAPRIC TRIGLYCERIDE, SORBIC ACID, CAPRYLYL GLYCOL, PHENOXYETHANOL, TOCOPHERYL ACETATE (VITAMIN E), SYNTHETIC FLUORPHLOGOPITE (IN GOLD SHADE), CALCIUM ALUMINUM BOROSILICATE (IN PLUM SHADE), TIN OXIDE (IN GOLD AND PLUM SHADES), SILICA (IN GOLD AND PLUM SHADES). MAY CONTAIN [+/-]: TITANIUM DIOXIDE (CI 77891), MANGANESE VIOLET (CI 77742), IRON OXIDES (CI 77491, CI 77492, CI 77499), ULTRAMARINES (CI 77007), CARMINE (CI 75470) CONTANS CARMINE AS A COLOR ADDITIVE. ISOTRIDECYL ISONONANOATE, SILICA, ALUMINUM STARCH OCTENYLSUCCINATE, PHENYL TRIMETHICONE, ISODODECANE, ACRYLATES COPOLYMER, SYNTHETIC FLUORPHLOGOPITE (IN BLUSH AND BLACK SHADE), POLYETHYLENE, ETHYLENE/METHACRYLATE COPOLYMER, MICROCRYSTALLINE WAX, ISOPROPYL TITANIUM TRIISOSTEARATE, CERAMIDE AP, RETINOL, LACTIC ACID, BUTYROSPERMUM PARKII (SHEA) BUTTER, SODIUM STARCH OCTENYLSUCCINATE, STYRENE ACRYLATES COPOLYMER (IN BLACK SHADE), MOROCCAN LAVA CLAY, TIN OXIDE (IN BLACK SHADE). MAY CONTAIN [+/-]: TITANIUM DIOXIDE (CI 77891), IRON OXIDES (CI 77491, CI 77492, CI 77499), RED 7 LAKE (CI 15850), RED 6 LAKE (CI 15850), BLACK 2 (CI 77266)"
I had gotten this palette last year and ended up giving as a Christmas gift. Then I regretted doing that. I’m so glad I purchased it again, and at a better price too! It’s a good on-the-go palette and a quality product. The application came out a little tacky with the bronzer and blush. However the eye shadows were fine and applied flawlessly. I used this to do my 6 year old nieces Halloween make up. She loved it but she also destroyed my pallet trying to do it again herself!! I loved the ease and feel of it in her skin. No irritation and I would recommend it for anyone. One of the best palettes ever! I can’t believe how great this palette is! I bought it because it was so different (putty to powder formula) and was a terrific bargain. After trying it, I was floored how beautifully the colors applied and blended, how great they looked and lasted and how my extremely sensitive eyes weren’t bothered a bit. These colors are more versatile and blendable than the formulations in other popular high-end palettes I have that are considered “holy grail” by many You Tube channels. I would love to see PUR come out with other versions of this palette in the future. I’m tempted to purchase a “back up” in case I run out of this palette, although it would be hard to do, because this formula is highly pigmented and a little goes a long way. Love this pallet! Blends beautifully, and lasts all day. A makeup artist I know complimented my eye makeup at a party. The contour is a great color, not too dark. Best on the go palette out there! This is the best palette out there! The colors are insanely pigmented and beautiful color payoff... Absolutely no fall out at all! I just played around with it tonight and made a very beautiful bronzy / gold natural look and used the contour shade to chisel out my cheek bones and the blush reminds me of the Nars Orgasim Blush. These eyeshadows stay on all day long! I have trouble finding ones that don't disappear around lunch time on me but all of Pur eyeshadows are the da bomb! Love love love! Beautiful colors and the eyeshadows are pigmented. I have this and the colors are so vibrant and highly pigmented and the gold is STUNNING! When you ladies are on the go just put that pallete in your bag it even has a cream bronzer and blush! Ranks up there with my favorite pallates. Eyeshadows are intense with color and I don't experience "fall out" with these shadows. I can create a daytime look or an evening look. The creamy blush and bronzer are beautiful tones and make my skin look so pretty. After seeing some bloggers do some looks with this palette on Snapchat I new I had to try it, and the pigments didn't disappoint! The bronzer and blush I was a little worried about being that they are cream, but they are actually extremely beautiful and blend great over the top of powders. This will be my go to palette for this season. The pigment in these shadows are to die for! There is absolutely no fall out! I was a little iffy on the orange shade but it is gorgeous for a fall eye and anyone with green/hazel eyes! It makes my eyes pop! I love that it includes an eyeliner, bronzer, and blush so the only extras I need besides the palette is my complexion and mascara products! Perfect for travel! This palette is insane!! The pigment is incredible and absolutely no fallout. I love the fact that this palette has a clay to powder liner, bronzer and blush. Great texture and color payoff. So impressed by this palette, definitely a must have for the holidays. Eyeshadows have a ton of pigmentation! The cream blush an cream bronzer blend so perfectly. this product is easy to use and has wonderful quality and pigmentation. bought this less than a month ago. do glad i did. i take it every where with me. I'm so in love this palette is very pigmented and really easy to apply. Amazing color combination! Great for any time. Love it! Every time I play with this pallet I find so many new things I can do with it. Makes an amazing smokey eye and I love the blush! So going to use this every day! I just got this and am so happy, its just like as described! The gold is such an amazing color. I bought this 3 days ago and fell in love with it from the start.The colors are very pigmented.So easy to apply and beautiful. Sadly I went to San Antonio for a two day getaway .My car got broken into. They took all of our bags and in it my Transformation pallet. The officwr that mmae our report just smiled when I was so upst they had taken my makeup.It is great I loved the colors. I am getting can new one as aoon as I can. Very good product! Good pigment and wear time! Would purchase more products! This pallet is super fun! All the colors are perfect to achieve different looks! I love the super rich pigmentation and texture so much! My favorite thing is the black eyeliner! This is a great product so many options with it! What a fun pallet for the eyes and cheeks great pigment and no fall out. Lasts all day and I love the fact that it doesn't contain any parabens. The colors are insane! Love the pay off and it lasts! I love the pigments of the eye shadow. The gold color is my favorite. I get compliments on my makeup every time I wear this palette. This palette has amazing pigments and it's so versatile! You can use the creams for eyeliner and eyeshadows. Plus it's good for your skin! I love the transformation pallet. So happy I bought it!